This entry was posted in General on April 14, 2019 by tsdp. Choose your best, most charismatic and smartest employees for your trade show exhibiting staff. Prior to the event, have your staff rehearse a sales pitch that aligns with your overall branding message. The sales pitch should be in two forms: a short 15-minute pitch to grab the customer’s attention and a detailed sales pitch to demonstrate the value of your products to interested prospects. Advise them of the best practices for face-to-face selling so they can win over your customers. They must also possess an ability to answer questions on the spot, interact with different types of customers, and overcome any objections. Do not train your staffs to be too focused only on pitching your products—doing so may cause them to forget to listen to the needs of customers. If you don’t understand what your target audience expects from your business, failure could be just around the corner. The path to a customer’s heart is through listening. When your staff develops the ability to listen to the concerns of your customers, it strengthens the bond of trust which in turn helps to win your customers over. Listening to your customer feedback can help meet their needs and expectations. Have your staff be aware of repetitive problems reported by past clients to avoid dissatisfied customers in the future. Since your trade show staff represents the face of your organization, it is essential to have your employees well dressed and greeting your visitors in a warm, professional manner. Physically, your trade show exhibit team should carry themselves well from body language to groomingand booth attire. Train them to use a welcoming body language that helps visitors to engage with the booth staff. Welcoming body language helps create a friendly atmosphere and provides a great chance for winning the goodwill of booth visitors. A well-groomed staff can project a professional image and stand apart from the crowd. Enforce grooming standards for having a polished appearance head to toe—polished representatives are more approachable. When they adhere to professional and uniform attire, it helps them impress customers at trade shows. Your customers are visiting your booth to learn about your products and services. Therefore, it’s essential that your staff be made up of employees who are highly knowledgeable about your company details. Make sure they gain adequate information, that way they can convey key messages to the booth visitors. Hand out product literature to every member of your trade show booth staff and coach them on how to demonstrate your products and services. Each booth staff should ensure they can communicate enthusiastically in order to build trust among the customers. Closely watch the booth staff practice and role play their interactions with one another to check whether they deliver the brand message consistently, accurately, confidently, and concisely. Before you plan for a killer trade show exhibition, make sure to train your staff for improved lead generation and increased brand awareness. A successful staff is the key element for a successful trade show. When you bring the right people to your trade show booth, you’re setting yourself up for greatness. Trade show attendees expect a lot more out of your booth than they did in previous decades. Just because you build a trade show booth with your exhibits doesn’t necessarily mean you’ll automatically attract your customers. They expect something that leaves them with a lasting memory. Virtual reality sessions, special trade show deals, contests, celebrity talks, and live product demonstrations can help visitors remember your brand. Charity donations can immediately shift the perception and attitude of your brand, thereby making an impact on millennials. Here are two important ways to catch the attention of your target customers while drawing them to your booth without pressure. Geofencing is a powerful tool that helps businesses and organizations target conference and event attendees even after they stepped away from your trade show booth. Geofencing uses GPS and other routing algorithms, allowing you to send push notifications within the geofenced area. Several savvy brands use location-based advertising for promoting their booth, products, and services. This targeting strategy lets you tag gadget users within the perimeter of the event and allows you to send powerful marketing alerts to drive event attendees. Geofencing s a great way to cut through noises and advertisements of other competitors on the floor. You can use geofencing to convey different messages at various intervals of time. Send a welcoming message to let your visitors know about your booth location and business details. If you’re offering promotional items, convey a message such as, “We welcome you to the XYZ show. Stop by ABC at West entrance to receive our valuable giveaways.” Doing this will drive traffic to your booth. Similarly, you can get feedback from your target audience by sending a survey asking about their booth experience. This way you can get their contact details easily for follow up purposes. Geofencing is one strategy that can engage and enhance your attendees’ overall experience. When it comes to exhibiting your products and services, there are many ways to improve your booth design. Depending on your business context and the positioning of your products, choose high-quality trade show displays that communicate your brand message across the exhibit hall. Consider using a unique theme with attractive fabric trade show displays and incorporate cutting edge technology for bringing your brand identity to life. Color, light, and motion are the three factors people respond to the most. Choose color schemes wisely because they can subconsciously trigger emotions. The right blend of colors sparks the visitor’s curiosity without needing to say a word. Introduce a motion element to attract more audience to your booth. From product demonstrations and moving lights to LED video walls, animations, and kinetic sculptures, your motion gets noticed easily. Provide a vibrant and bright booth presence by incorporating strategic lighting with directional sounds. This entry was posted in General on March 3, 2019 by tsdp. Gone are the days with events filled with monotonous presentations. In a competitive space like trade shows, generating leads aren’t as easy as you think. Doing so requires creativity, communication, and tech awareness. Formal invitations and social media marketing may attract event visitors, but these alone cannot help you achieve your trade show goals. You must make your attraction methods line up with what your customers want. Your ultimate target is to accelerate the sales funnel and build brand awareness among the audience. Here’s how to make your potential clients stop and notice your exhibits. A trade show booth design can either make or break the show. Design something unique and make your booth welcoming and inviting to visitors. Get a big booth and incorporate a perfect backdrop for engaging your customer with business content. Our retractable banner stands and fabric banner stands can easily set up anywhere to showcase your logo and business information, even in a large crowd gathering. These large and tall banners can forge a great deal of publicity, even at sporting events, malls, and theaters. Since we use long-life inks and durable materials, these color palette banners are highly resistant to wear and tear. They also give you a lot of flexibility with storage and traveling. Create a graphic impact by using easy-to-read messages, illustrations, and photos. The fewer elements you display on your banners, the more impact you can create among your audience. Visit us to design, print, and set up incredible trade show banners and to create a favorable impression among your visitors. Showcasing your services at a marketing event lets you compete with dozens of other businesses that all share the common objective of being the best in the industry. In this situation, standing out and winning people’s trust is a big deal. 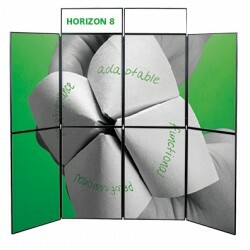 Smart trade show exhibitors keep their customers engaged and entertained by creating a multi-sensory booth experience. One great way to that is to bring a virtual reality demo of your products to grab customer attention. The multi-sensory experience can easily pique the interests of those around the event. These can help to engage your prospects on a level that no one else on the floor is reaching. The virtual reality demo can help your audience interact with your business’s services. The demo also helps to trigger curiosity and draw crowds into your trade show booth. They make your visitors see your company is utilizing some of the latest technological advancements. Spice up your trade show exhibit designs with attractive backlights and bold colors. Light up your illuminated logo with hanging lights to attract trade show visitors walking down the aisle. Flashing, moving, and twinkling lights can be used based on your target visitors. Set the appropriate tone and mood for your exhibits so your visitors feel comfortable to buy your products. Brand color palettes play a significant role in your exhibit design. They are a valuable element that can convey a powerful message about your company. In a sea of colors, design your booth with bold colors that delight people’s senses and cultivate a strong brand experience. If you’re looking to maximize your brand’s trade show experience, include gaming, quizzes, contests, a Wi-Fi party, gourmet food services, and valuable giveaways to make your event an unforgettable one. 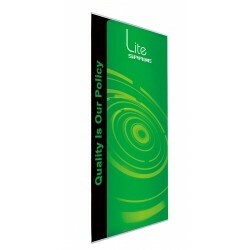 Banner stands are an indispensable element of trade shows and exhibitions. 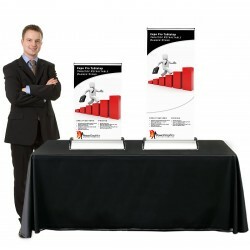 Of all the different types, retractable banner stands are probably the most popular. The banner stands have a roller mechanism that can hold the banner under tension. It rolls back easily to the base when not in use. They’re very easy to use and set up, and you can carry them easily anywhere. 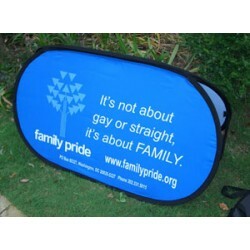 They’re versatile as well: combine a few retractable banner stands and you have a banner wall ready for an event. Tension fabric trade show displays make use of aluminum poles and extrusions to create displays that are stretched well, ensuring the graphics look clean and wrinkle-free. You can also make the graphics pop out on tension fabric trade show displays with backlighting. 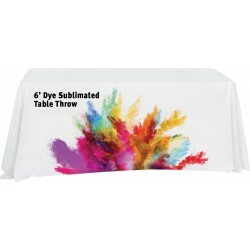 They’re available in a wide range of shapes and can be customized to match your booth design. 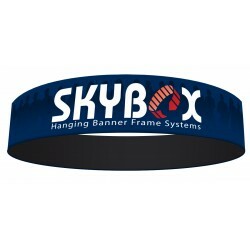 Hangingfabric displaysare used for high visibility. You can hang them from a ceiling to make sure visitors don’t miss you from anywhere within the exhibition. Aluminum tube sections are combined to form a wide range of shapes and they’re attached to a pillowcase graphic attachment. 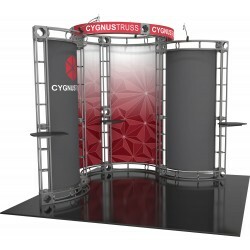 Are you looking for trade show display ideas? Call us to find the one that’s perfect for you! This entry was posted in General on February 10, 2019 by tsdp. Banner walls are created by combining individual banner stands to form one large wall. They’re very popular at sporting and media events and also at shopping malls. Using banner walls creatively within your booth can attract people to your business by helping make you look bigger and more important than many of the business around you. 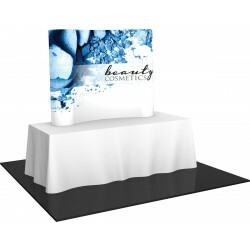 For example, use banner walls on an open layout and then place smaller trade show displays like a counter or kiosk in front of or at the corner of the booth. Use the counters to hold giveaway contests; these are ideal for meet and greet purposes. 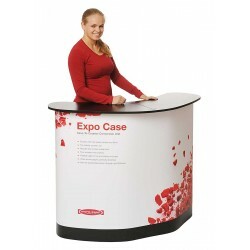 This helps you create a booth that attracts attention, but also keeps the visitors engaged once they’re there. Or, you could create banner walls to create a store-like layout and line your products. Banner walls work well if you have a huge choice of products to offer: they encourage attendees to browse and interact with your brand and help convince them to buy. If you’re in a particularly crowded trade show, you may want to consider using hanging fabric displays. 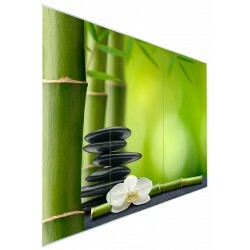 These can be hung up high and can often be seen from anywhere in the trade show floor. 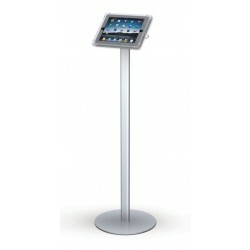 They help to draw the attention of visitors, allowing them to locate your booth regardless of what’s on the floor around you. Overhead hanging fabric displays can also make a booth look larger than usual and generate curiosity among visitors. Canopies and tents are a favorite at farmers markets, festivals, and open exhibitions. The best thing about a canopy is that they’re easy to use, and the back or side wall can be used to display your graphics or logo. Are you looking for trade show display ideas? Call us! What Does A Good Lead Look Like? Customers who are ready for a sale and are visiting your booth for a specific purpose can be classifiedas a hot lead. They are closest to the buying cycle and easy to convince. Ensure that the sale process goes smoothly to open new doors to potential clients via referrals. Cold leads need nurturing and cannot be converted overnight. They are not ready to buy your product but can be convinced over time and follow up. You can convince them by demonstrating what you can do for them and pique their interest. Warm leads are people who show interest in your product, either by signing up for the newsletter, stopping by to comment on your trade show displays, or following you on social media. While you don’t have to chase them, these clients need a push in the right direction. The best way to convert a prospect is to understand them. Use the lead capture form to not only collect basic information like email address, phone number, company position, name, etc. but also to take notes that could help you start a future conversation. Did you discuss a timeline for the purchase? Did the lead express concern about the budget? It all begins by asking the right questions. Rather than overwhelming the prospect with details and descriptions about your product, let them talk to understand who they are and what they need. The lead capture form that we discussed earlier must include a system that helps you identify and keep track of visitors. Create tags to know their profile (sales, marketing, operations, etc. ), product interest, areas covered, etc. Use these tags as a reference to ask the right questions and learn more about the visitor. Creating tags not only simplifies work but also saves time – enter these details in an Excel sheet and organize leads based on their tags! But all of this starts with getting people to visit your booth. And that starts with the right trade show displays! If you’re looking for affordable banner stands and trade show displays, contact us! 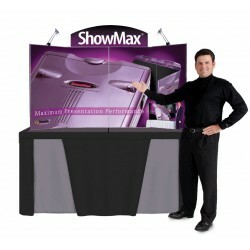 We’re America’s leading online trade show banner stand and trade show display store! This entry was posted in General on January 6, 2019 by admin. Trade shows and face-to-face marketing promote and sell products and services to your customers. We’ll help you design, build, deliver, manage, and store a custom tradeshow exhibit – an essential element in your successful event strategy. What are your objectives in exhibiting products at live events? Examples include increased brand awareness, lead generation, relationship building, and short or long-term sales. Once you’ve established your goals, next assess your brand’s needs. What exhibit size will you need? Will you need multiple exhibits? What is your overall budget? Will you need help creating banner graphics? Next choose the style of your new booth – conservative, elegant, high-tech or minimalist. Then specify the feel of the booth– open, freeform, or symmetrical. Finding an exhibition partner is a crucial step in designing your trade show exhibit. The best partner offers high-quality exhibits that meet your goals and stay within your budget. A bold, experienced partner can provide additional trade show services such as replacement graphics designs for banner stands, tabletop displays, counters, and kiosks. At Trade Show Display Pros, we sell a premium range of banner stands, pop up displays, fabric trade show displays, portable flag stands, literature racks, and banner designs at attractive prices. Many of our trade show displays are covered under a lifetime warranty. Looking for vibrant, digitally printed, full-color banners? Trade Show Display Pros are the perfect partners. Our exhibits pack in a portable carry case and set up easily – an ideal solution for any marketing event or lobby showcase. 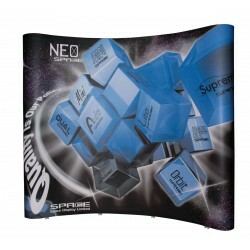 Professionally finished and classically presented, our trade show bannerstands will satisfy your promotional needs! Next, choose the construction style of your booth. Common construction styles include fully customized (exhibit designed entirely from customized materials), semi-customized (an exhibit that is custom designed from standard pieces and off-the-shelf components and modules), and systems (exhibits that are pre-designed in specific sizes and configurations). Some exhibitors use in-house creative teams or graphic design agencies to handle the design of their display graphics, and others are able to handle the design themselves. For those that don't have the ability to handle the design work, Trade Show Display Pros can provide that service as well. If you already have a display and just need updated graphics, Trade Show Display Pros can provide replacement graphics for any style of display. Call 877-389-8645 and speak with our experts to update your promotional message. Our products have been extensively testedfor durability and aesthetic appeal. These top tips for creating a great marketing plan will optimize your promotion strategy. Increase event attendance and visitor satisfaction while saving time and energy. Trade Show Display Pros can make your next event smarter and more captivating. A successful trade show requires a great deal of planning and research. It is one of the greatest networking tools in today’s marketing world. If you’re an exhibitor looking for trade show tips, here are a few golden rules to increase your leads for a positive return on investment. Engaging tradeshow attendees is vital because when people walk by your booth and getting them to stop and look at your exhibits is critical. If you want to stand out, it is essential to create a long-lasting memory either by having attractive signage or hosting contests, giveaways, fun activities or games. Great ways to attract attention is by using interactive experiences with virtual reality headsets and touch screens like tablets at your booth that let your client engage with the pre-programmed content. The content can be videos, demos, or information about your products and services. With all the buzz around SEO and digital media, we may sometimes lose sight of human connection. Tradeshows and expos are a great way to enhance this connection. Normally people buy from someone they trust, like, and are by their side. It is vital that your exhibition staff stay energized throughout the day to deliver valuable insights about your services. Since you are industry experts in your own domain, you can use this excellent opportunity to educate the trade show attendees. When you build a strong relationship with your clients and see them at future events, you can also ask for referrals. Successful trade show exhibitors know the importance of a quality booth. The key here is to think creatively and design effectively. Based on your budget, you can purchase high-quality retractable banner stands, or tabletop retractable banner stands that have outstanding graphics in attractive colors. When you use large and easy-to-read fonts, your brand message can be highly visible even in the larger setting. Giveaways are an essential marketing strategy to elevate your brand and attract potential visitors to your booth. Creating a sort of “game of chance” can get people involved in a fun system for collecting entries. The prize you offer should be appropriate for your target audience. You can consider giving electronic gadgets, tickets to entertainment, mobile phone accessories, power plug kits, personalized tote bags, reading glasses, promotional pens, elastic bands, T-shirts, or other marketing items. These gifts can develop a favorable impression of your brand in the audience’s mind. Trade shows play an essential role in your company’s marketing strategy. It is vital to adopt the right approach for connecting with prospective clients. You can use of all the above tips to generate leads that will actually convert. 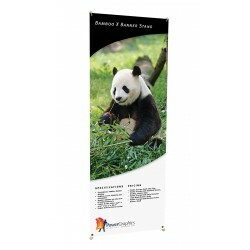 This entry was posted in General and tagged tabletop retractable banner stand, tabletop banners, retractable banner stand, tabletop banner, retractable banner, retractable banner stands on December 10, 2018 by tsdp. If you’re planning to have a successful trade show, the level of effort you put in matters. You can use this platform to increase your brand awareness, learn about what’s going on in your industry and network with potential customers. Here’s a list of top trade show tips and strategies to maximize your return on investment. Have you ever visited a marketing event and noticed a large gathering in a certain area? The crowd may attract you, and so you may take a peek at what’s going on at the booth. In the middle of the crowd, you’ll find someone demonstrating a product or service. Product demonstrations grab customer attention. Giving product live demos at trade shows is a great way to attract your audience. This is a great way to help people remember your product long after the event. If you’re trying to create a buzz around your conference or marketing event, it is good to book actors, TV reality stars, comedians, musicians, and entertainers to draw a crowd. It is essential to choose the right personality or speaker based on your company’s marketing objectives. With expos, conferences, marketing events and trade show season approaching, you may want to invest in a high-quality banner stand. 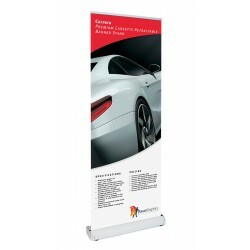 You can buy affordable and easy-to-use trade show banner stands online for maximum visibility. Our retractable banner stands come in a wide range of styles, sizes, and brands to help you make a lasting impression on your customers. You can also check out our other products such as tabletop banner stands, banner walls, outdoor displays, replacement graphics and different banner designs at great prices. It is essential to recruit the most active players for exhibiting your products at the trade show. Make sure your team dresses well with a common style so that it will be easy for your visitors to identify your exhibit staff and make sure that your exhibitors have salesmanship skills while engaging with the customers. Prepare your team to deliver brand messages concisely, accurately, confidently, and consistently. It is essential to have a well-planned and well-executed face-to-face interaction that can amplify your brand presence. These tips can surely help you rock your next conference or live marketing event. As mentioned earlier, our banner stands can make your tradeshow booth look great. We wish luck in generating more leads and improving your marketing goals.